Bolivian President Evo Morales has said he will expel the US Agency for International Development (USAID). Mr Morales accused the agency of seeking to "conspire against" the Bolivian people and his government. US state department spokesman Patrick Ventrell rejected the allegations as "baseless and unfounded". USAID has been working in Bolivia for almost five decades, and had a budget of $52.1m (£33.4m) for the country in 2010, according to its website. The agency said it deeply regretted Mr Morales' decision. On previous May Days, Mr Morales had announced the nationalisation of key industries, such as hydroelectric power and the electricity grid. But on Wednesday he said he "would only nationalise the dignity of the Bolivian people". Speaking at a rally in La Paz, the president said there was "no lack of US institutions which continue to conspire against our people and especially the national government, which is why we're going to take the opportunity to announce on this May Day that we've decided to expel USAID". He then turned to his Foreign Minister, David Choquehuanca, and asked him to inform the US embassy of his decision. The president said the expulsion was in protest at a recent remark by US Secretary of State John Kerry, who referred to Latin America as "the backyard of the United States". Mr Kerry made the remark as he tried to persuade US Congressmen of the importance of the region. Mr Morales has threatened USAID with expulsion in the past, saying that its programmes have "political rather than social" ends. He has also accused it of "manipulating" and "using" union leaders. Mr Ventrell said Mr Morales' decision "harms the Bolivian people". "We think the programmes have been positive for the Bolivian people, and fully co-ordinated with the Bolivian government and appropriate agencies under their own national development plan," he said. In a statement USAID said: "Those who will be most hurt by the Bolivian government's decision are the Bolivian citizens who have benefited from our collaborative work on education, agriculture, health, alternative development, and the environment." Mr Morales, who heads his country's union of coca growers, has also been critical in the past of US counter-narcotic programmes in Bolivia, repeatedly stating that the fight against drugs is driven by geopolitical interests. In 2008, Mr Morales expelled the US ambassador and Drug Enforcement Administration (DEA) for allegedly conspiring against his government. Bolivia is among the top three producers of coca in the world, according to the United Nations World Drug report. Coca, the raw ingredient for cocaine, has been used in the Andes for thousands of years as a mild stimulant and sacred herbal medicine. USAID cites as its main aims the strengthening of Bolivia's health system and the provision of "equal access to health care by eliminating social exclusion", as well as improving "the livelihoods of economically and socially disadvantaged people by increasing income and managing natural resources". The agency also supports programmes to help Bolivian farmers to replace coca with other crops. The US government had a separate budget of $20.3m (£13m) for its counter-narcotics and military programme in 2010, but it is not clear which agency distributes that money in Bolivia. 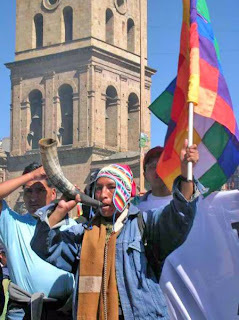 Evo Morales became Bolivia's first indigenous president in 2005. He was re-elected by a landslide in 2009, but has since faced protests from indigenous communities angered by the construction of a major road through their territory, and by police and army officers demanding better pay.